John "Bill" Cowden, Petty Officer 1/c, born Sept. 10, 1920, St. Joseph, MO, received his BS degree in business administration from the Missouri State University. He joined the USN Sept. 24, 1940, and for six weeks was stationed at Great Lakes NTC; assigned to the USS West Virginia for five years; then stationed at the San Diego NTC. During the attack on Pearl Harbor, he was hit by the Japanese shrapnel and had to be fished out of the oily water. 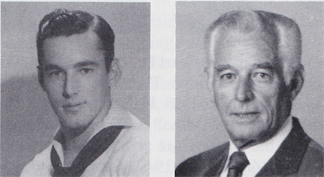 Cowden was discharged Nov. 20, 1946, with the rank of petty officer 1/c. He received the Pearl Harbor Medal, Philippine Liberation Medal, two Good Conduct Medals and battle decorations for the battles at Surigao Straits, Iwo Jima and Okinawa. He and his wife, Sammi, have one child and four grandchildren. He retired May 1, 1982, from Gulf Oil Corp. after working as a national sales manager in the plastics division, Houston, TX. He enjoys golfing, hunting and traveling.